The 7 Steps of Data Analysis | StatsWhisperer | Statistics Training, Books, Videos & More! Get the book free when you register for The Steps of Data Analysis webinar class. 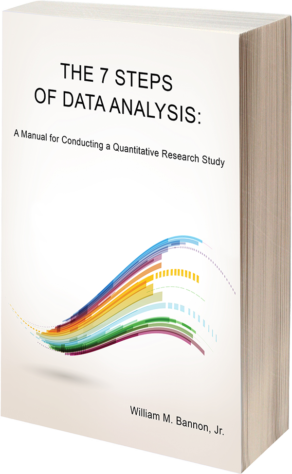 The primary purpose of this book is to empower the user to conduct a legitimate and effective data analysis project (a quantitative research study) from the point of conceiving of a research question, through statistical analysis, and to the completion of the project, in a professionally formatted (APA, AMA) manuscript that presents the study results. Your feedback is highly valued and we thank you in advance for taking the time to provide your input! Please note that we report the results of this anonymous survey on our website. Rarely can I say I have used the words “excited” and “text book” together, but the introduction alone of William Bannon, Jr.’s The 7 Steps of Data Analysis, elicits just such a response. His clear, measured, and “digestible” (cake pun intended) way of writing is undoubtedly designed to do just what he says: “make data analysis more understandable, meaningful, and enjoyable.” His approach to the text displays the intersection of his skill and knowledge as both social worker and statistician.